Resize Text: Normal Large Our Dental Clinic is situated in the Central City Shopping Mall next to Surrey Central Skytrain Station in Surrey BC. Brush twice a day: This one is a no-brainer and obviously it would have made the list. The easiest and most important thing you can ever do to try and make sure your teeth are white as they can ever be is to brush them when you wake up in the morning and before you go to bed. Using whitening toothpaste or toothpaste that has the Canadian Dental Association (CDA) Seal of Approval is your best bet. A typical tube of whitening toothpaste can go for about $10 at your local drugstore. Tubes with the CDA Seal contain many abrasive particles to polish teeth along with chemicals that remove stains. These toothpastes are just as easy on your enamel as the other leading brands. Whitening trays: These can vary in price, so pick one that fits your budget. The typical drugstore or supermarket can sell trays that range from $20-$50 and contain a one-size-fits-all tray that molds to the shape of your teeth. If you want a really professional tray, your dentist can create trays that are custom fitted to the exact dimensions of your teeth, but can run a bit pricier. All you have to do once you bring it home is put a tiny amount of peroxide gel into the tray, place it in your mouth, and follow the instructions on how long you should wear it for. Make sure to brush again when you take them off! One to two weeks is the magic number to start seeing results with whiter teeth. Whitening strips: You’ve definitely seen advertisements for these products on television. They are a bit cheaper than whitening trays and less chemicals are required to be inserted into your mouth. Each package will contain 2 strips: 1 for your upper teeth and 1 for your lower teeth. When purchasing whitening strips, take care and read the ingredients to make sure they do not contain chlorine dioxide. This chemical is mainly used to clean swimming pools and can cause significant damage to your enamel if left on the surface of the teeth for prolonged periods of time. The amount of time needed to wear them varies but rinse carefully once you remove them to remove any remaining adhesive gels. You should begin to see results in as little as 14 days. Ask your dentist: Seriously, as if this would not have made the list. 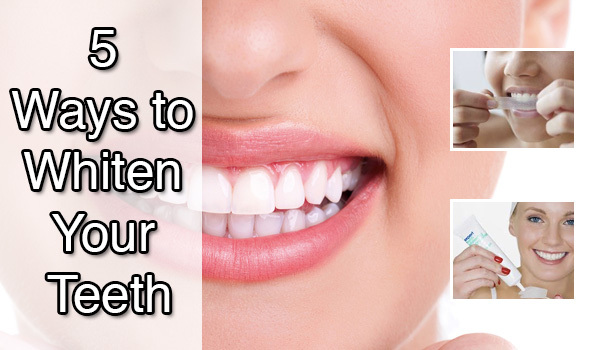 The best possible ways to whiten your teeth as easily as possible is to consult your dental professional. They know your teeth better than you do, and have the specific knowledge and tools for the best possible approach. One way is to have your teeth bleached professionally. Your dentist will place a rubber guard or protective gel on your gums and will then put a traditional whitening tray, peroxide gel included, on your teeth. Another method is laser whitening. A rubber shield is placed over your gums, a bleaching gel will be applied to your teeth and then a laser or bright light will be placed over them. The light is supposed to activate the chemical in the gel that in turn whitens your teeth much more quickly than with traditional bleaching methods. Change your diet: The whiteness of your teeth is hugely dependent on what you eat and drink. Chewing tobacco or drinking liquids such as coffee, black tea, red wine, grape juice, sodas will definitely discolor your teeth. A slightly better alternative to drinking these beverages is to enjoy them through a straw to reduce the impact they can have on your teeth. With the Dental Group at Central City, teeth whitening couldn’t be easier. Our dental team takes exact measurements of your upper and lower teeth and these impressions are used to make customized bleaching trays that perfectly fit your mouth. Wearing the trays for a few hours every day is all you need to ensure a beautiful white smile! I went for teeth cleaning with my daughter, it was her first visit with a dentist. I knew they would be great with her but they were beyond my expectations - provided an educational video, let her play with a dino and brushed his teeth, gave a goody bag with teeth care supplies and stickers. One of the staff members took the time to play with her while I was getting my teeth cleaned. My husband and I have been going to Dr Sebastian for our dental care for years - never been disappointed. Always excellent quality care. Not to mention the office is beautiful and the staff is really nice. I always recommend him to my friends and family. Dr. Maru has been our family dentist for over a decade. He is a great diagnostician, has a professional and painless approach, he is a lovely person and we recommend him highly. In addition, his office staff is excellent. Love the staff. They help you keep calm while sitting on the dentist chair. I love this dental office. The entire staff is friendly, efficient, and sincerely caring! They ALWAYS get me in super fast so they can perform necessary adjustments as needed. Dr. Thakore and Dr. Shon are always professional and extremely adept in every way. The support staff always treat me with the utmost respect and are empathetic to my needs. Once again KUDOS to this office, I am in good hands with them at all times. I've posted a review before, but I accidentally deleted it somehow. Regardless, my review hasn't changed. I've been a patient here for the past 3 years. I've had some minor work done by Dr. Thakore. Dr. Thakore is a wonderful dentist. She is professional, knowledgeable, and personable. She made all my visits comfortable and painless. She always puts me at ease, so I never dread visiting the dentist anymore. :) Also, all the staff I've encountered have been professional, friendly, and accommodating. I had a toothache from one of my wisdom teeth. I was in pain and needed assistant right away. My original dentist wouldn't take me in, but gave me suggestions on other dentists. I called this location and they were able to take me in almost right way. i got x-rays and set up an appointment to get my tooth removed. I was thrilled to know that they knew my situation and got me in as soon as they could. Very friendly. Highly recommend them!!! My family and l had been attending there this year and we are happy with the service, dr. Thakore is gentle and professional. She replaced my 10 year old crown and I paid less then the original quote. My toddler follow her instructions during the appointment and at the end, he received a little toy plus the cleaning tooth kit. I highly recommend this place. I've posted a review before, but I accidentally deleted it somehow. Regardless, my review hasn't changed. I've been a patient here for the past 2 years. I've had some minor work done by Dr. Thakore. Dr. Thakore is a wonderful dentist. She is professional, knowledgeable, and personable. She made all my visits comfortable and painless. She always puts me at ease, so I never dread visiting the dentist anymore. :) Also, all the staff I've encountered have been professional, friendly, and accommodating. Dr Chris Shon is amazing in my whole dental life !! Very compassionate, professional, patient, listening to all my concerns first, making sure the right problem tooth and do follow up. I don't even feel his needling me, I can go for a nap. Most important of all, he truly treats me like a REAL HUMAN!! Feel my pain as his!! I don't know what to do without his dental care for me!! Exceptional!! © 2019 Copyright The Dental Group at Central City | Vancouver Web Design & SEO.